Social media creates opportunity for interactive, real-time communication between public organizations and stakeholders. Citizens also take matters in their own hands and can disseminate information faster than public organizations. Crisis mapping is one social media response to crisis that began in the late 2000s. 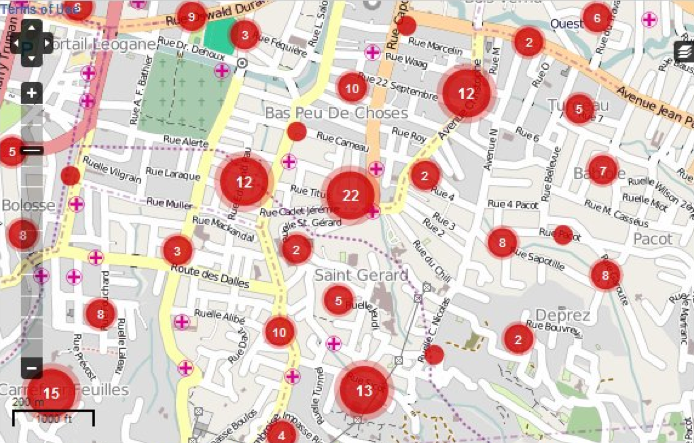 The first popularized example was in response to the Haiti earthquake in 2010, when Patrick Meier—crisis mapper, blogger and digital humanitarian—launched a crisis map hours after the earthquake. This individual effort was not part of a strategic, organized disaster response. Meier lived in the U.S. and had friends working in Haiti whose locations were unknown after the earthquake. Aside from his colleagues, 100,000 others were presumed dead. Meier wanted to do something. Meier’s first effort mapped tweets showing open pharmacies and places where people tweeted they needed help. Meier’s map was updated with satellite imagery and information from a SMS request line, using a translation program allowing English-speaking responders to interpret French Creole tweets and texts. The map evolved with contributions from more than 2,000 volunteers. Eventually the U.S. military used the data to rescue injured residents and deliver services. Crisis mapping was popularized after Meier’s map in 2010. In 2016, crisis mapping is commonly used for real-time updates in response to natural disasters and acts of terrorism. There are free and fee-based tools to map crises. Fee-based tools include Ushahidi and MapBox. Meier’s Haiti map used Ushahidi, a dashboard service that collects and displays geographic and large data sets on maps. Ushahidi offers a free, limited mapping service and a series of monthly subscription plans for up to $500 for 5,000 posts per month. Another tool is Mapbox, a vector-based mapping platform with a similar monthly subscription service of 1 million map views or 200,000 users for $500 per month. Some free tools are the Google Crisis Response toolkit, which includes Google Maps Engine Lite (a customizable maps service), Google Crisis Map (prepopulated with weather, hazard and emergency preparedness information) and Google Person Finder, which “helps people reconnect with friends and loved ones in the aftermath of natural and humanitarian disasters.” Crowdmap is a mapping service that links to users’ Instagram accounts. Stweet is a mashup of geo-located Twitter data and Google Maps’ street view for about 50 international cities. Who should map crises? When and where can crisis maps be most effective? How reliable is the data? Brandon Greenberg suggests users relying on crisis maps question how recently data has been updated and whether the information is reliable. Two professional organizations trying to streamline standards within crisis mapping are CrisisMappers.Net and the Red Cross. Crisismappers.net is an international community of professionals that was founded in 2007 to create standards and best practices through conferences and university courses. The Red Cross, in coordination with Dell, opened two Social Media Digital Operations Centers—one in Washington D.C. in 2012, and another in Texas in 2014—for professionals and volunteers to share reliable crisis maps. What information should be shown publicly, and when…? When should it not be shown? Do crisis mappers … unintentionally provide bad actors with … useful intelligence? … What responsibility does the crisis mapping community have to report and share mistakes…? Other limitations to consider are the geographic scope of the territory, type of data that will be most helpful and intended audience. Public service agencies or interested individuals can use crisis mapping as a useful, real-time response to crisis. The reliability of input data, the size and scope of the affected territory and the nature of the crisis or disaster will dictate to what extent a map can be helpful. If you or your organization are interested in crisis mapping as a crisis response option, consider the tools listed above as a place to start. For further considerations, refer to Stuart Middleton’s article, “Real-Time Crisis Mapping of Natural Disasters Using Social Media,” and “Innovative Uses of Social Media in Emergency Management,” by the U.S. Department of Homeland Security. Author: Haley Myers Dillon is founding director of Sacramento State’s Parents & Families Program. Before working in student affairs, she worked as capitol director in the California State Assembly. Haley has a master’s degree in Public Policy and Administration from Sacramento State and a bachelor’s degree in English from Cal Poly, San Luis Obispo. Contact her at [email protected].